Teigen, Rob and Joanna. 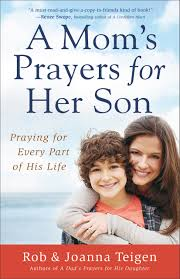 A Mom’s Prayers for Her Son: Praying for Every part of His Life. Grand Rapids, MI: Revell Publishing. 2014. Due to that special bond so many moms have with their sons, what better reinforcement than prayer can moms offer? Mixed with Bible verses, specific prayers and appropriately themed stories, A Mom’s Prayers for Her Son provides a strong starting point in praying. With seventy-five different areas covered regarding discipline, pressure, death, marriage, truthfulness and wisdom, each prayer is full of ideas and words yet allow for self expression and additions. Read as a devotional that can be prayed in a few moments, it is set up nicely to gravitate towards the necessary topic. A wonderful gift for a new parent or a seasoned parent, as every parent could use a shoulder to lean on while raising children. This entry was posted in Christian Books, Christian Devotional and tagged A Mom's Prayers for Her Son, Christian, Christian Author, Christian Book Review, Christian Non-fiction, Devotional, Inspirational, Prayer, Rob and Joanna Teigen by Savurbks. Bookmark the permalink.